Βαθμολογήθηκε από επισκέπτες, μετά από τη διαμονή τους στο Rendezvous Villas. Villa was spacious and right next to the beach. Airport shuttle was pefect. Driver Chad is a stand-up guy! Great facilities and location. Chad was very friendly and efficient. Perfect if you want to get away from it all, but also close to Muri Beach's cafes, markets, rentals etc. Perfect, spacious villa for two people. Liked the fact that we had deck at the front with access right onto the beach and then the great courtyard with small pool as an alternative if it got too windy, best of both worlds. Privacy a big plus! I would definitely stay here again. Good self cooking facilities. Great snorkelling outside the front door. Very private. Great pick up from airport with smooth and effortless entry to Villa by Chad the service manager. lovely interior upgrades and refurbished swimming pool with new outdoor terrace furniture since our last visit three years ago. This was a short stay but pleasant with a nice service of Villa after the first night. The beachfront location and stunning lagoon colours along with spaciousness and privacy will see us return. Absolute beach front - gorgeous location. Fruit on arrival. Owner allowed us a couple of extra hours in one villa to wait for airport pickup on last day. Amazing villa. Private, enclosed pool. Right on the beach. Easy walk to Muri. Friendly hosts. Personal airport pick up and drop offs, and property tour, some food and drink provided free of charge, dropped off umbrellas when it started raining without us having to ask! AMAZING service, beautiful location, everything we could need in the luxurious, spacious, private, air conditioned, self contained villa right on the beach. Beach towels, snorkeling gear, kayaks, bbq, private pool, sun loungers front and back, outdoor table and chairs, super king bed, toiletries, books, dvds! Good location. Close to Muri Lagoon, shops, restaurants and night market for yummy and affordable meals. Bathroom size and facilities were great, plenty of space for his and hers. Very comfortable king-size bed. Εξασφαλίστε μια εκπληκτική τιμή στο Rendezvous Villas - με βαθμολογία 9 από πρόσφατους επισκέπτες. Ένα από τα καταλύματά μας με τις υψηλότερες πωλήσεις σε Rarotonga! Located alongside a private white sand beach, Rendezvous Villas each offer a swimming pool and a large patio featuring sun loungers and BBQ facilities. Guests enjoy free airport transfers and the use of snorkelling equipment and kayaks. The villas offer a fully equipped kitchen with an oven and spacious dining area. Each has a lounge area with sofas, a flat-screen TV, DVD player and a stereo. The tour desk can arrange fishing charters, island tours, dinner cruises, cultural experiences and 4WD adventures. 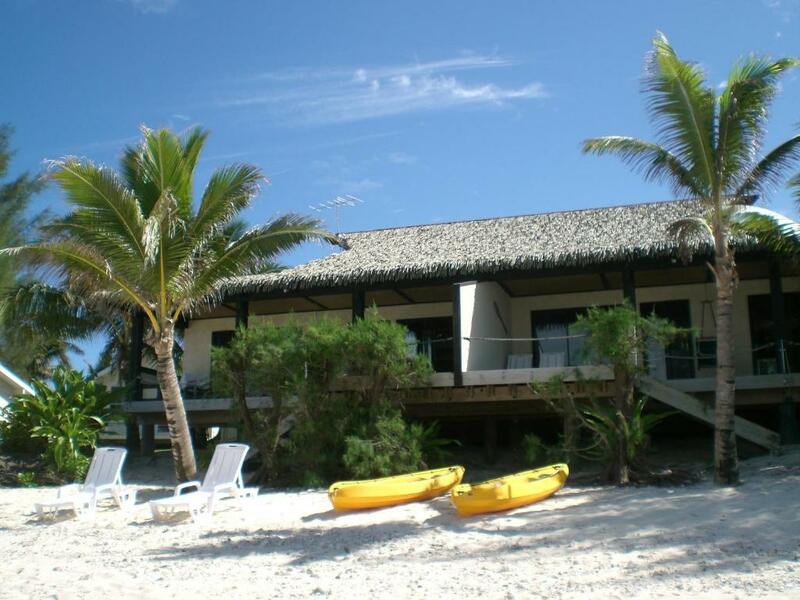 Guests can enjoy wind surfing, kite surfing and sailing nearby. Situated on the southern end of Muri Lagoon, Muri Beach Rendezvous Villas are just 15 minutes’ drive from Rarotonga International Airport. There are restaurants, shops and bars within 20 minutes’ walk. Το Rendezvous Villas υποδέχεται επισκέπτες της Booking.com από 14 Μάη 2013. This villa features a large patio with sun loungers, a private pool and BBQ facilities. It offers a fully equipped kitchen, a dining area and a lounge area with a flat-screen TV. There is an en suite bathroom with bathrobes and quality guest toiletries. Rendezvous Villas offers very private, quiet, and beachfront location with direct access toot he beach and lagoon. The Muri area offers wonderful dining opportunities with a number of boutique cafes and restaurants close by. Also the Muri Food Market operates Tuesday, Wednesday, Thursday and Sunday evenings. A great opportunity to mix and mingle plus dine in a very relaxed environment with the locals and other visitors. Adventure type activities, including kayaks, paddle boards, kite surfing, underwater paddle boards all operate while land based activities when booked provide door to door pick up and drop off. Διαβάστε πριν κάνετε κράτηση Το Rendezvous Villas δέχεται ειδικά αιτήματα - προσθέστε τα στο επόμενο βήμα! Παιδιά μεγαλύτερα των 11 ετών είναι ευπρόσδεκτα. Όλα τα ενήλικες ή παιδιά χρεώνονται NZD 80 ανά νύχτα και ανά άτομο για επιπλέον κρεβάτια. Αυτές είναι οι κάρτες που δέχεται το Rendezvous Villas και διατηρεί το δικαίωμα να δεσμεύσει προσωρινά ένα ποσό πριν την άφιξή σας. Free transfers are available to and from Rarotonga International Airport. Please inform Rendezvous Villas in advance if you want to use this service, using the contact details found on the booking confirmation. Rendezvous Villas does not accept payments with American Express and Diners Club credit cards. Παρακαλείστε να ενημερώσετε το Rendezvous Villas εκ των προτέρων σχετικά με την αναμενόμενη ώρα άφιξής σας. Μπορείτε να χρησιμοποιήσετε το πεδίο για Ειδικά Αιτήματα κατά την κράτηση, ή να επικοινωνήσετε απευθείας με το κατάλυμα, στα στοιχεία επικοινωνίας που αναγράφονται στην επιβεβαίωσή σας.